"The Valley Plaza Shopping Center, a 900,000 square foot enclosed mall shopping complex at Ming Avenue and New Freeway 99, was opened in February 1967. Seventy tenants occupy the mall, with Sears, The Broadway, and Brock's at terminal points of the enclosure. The huge parking area surrounding the main building also serves adjacent pavilion shopping facilities. Interior decor reflects the Spanish influence on Southern California in a contemporary manner." I don't see any info or history online (on Google anyway) about this little shopping center/plaza, so I have no idea whether or not it's still around today, and if so, under what current retail moniker. I just dug this pretty retro postcard and wanted to share it. Classic vintage shopping center atmosphere, don't you agree? "Sunvalley Shopping Center. An aerial of the newest and most modern shopping center in the U.S.A. It is completely enclosed and air conditioned." A wacky 1983 Chicago television commercial for the Fox Valley Center mall (aka Westfield Fox Valley), in Aurora, Illinois--using generic Muppet-like local puppet talent. The mall's current anchor stores are: Carson Pirie Scott (originally a Lord & Taylor), JCPenney, Macy's and Sears. (Excerpt) Downtown business districts have been losing customers to fast-growing suburban shopping centers, but a lively exception is Chicago's North Michigan Avenue. During the past decade, $2 billion worth of construction has risen on and near North Michigan, which Chicagoans call "the Magnificent Mile." California's Magnin has just opened a branch there, joining already established Bonwit Teller and Saks Fifth Avenue of New York, as well as such fashionable shops as Tiffany and Cartier. Soon they will be joined by Dallas' Neiman-Marcus. Two weeks ago came the biggest news of all. Chicago's retailing giant, Marshall Field & Co., whose main store in the Loop on State Street is scarcely a mile away, and New York's Lord & Taylor announced that they will both open branches in Water Tower Plaza, a $100 million shopping, hotel and apartment complex that will go up on the avenue. 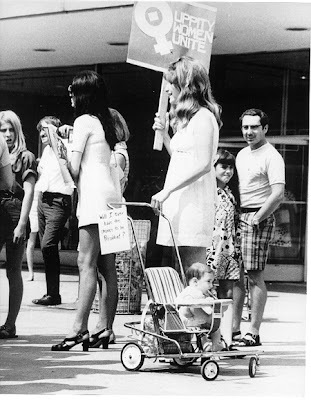 Interesting historical photo snapped during the "Women’s March for Equality" at the Garden State Plaza mall (aka Westfield Garden State Plaza) in the summer of 1970. Uppity women unite! If you're interested you can read more about the event over at the page I found this photo on. Groovy chicks, groovy fashions (check that dude's Bermuda shorts), and a cute little baby in a groovy stroller, what's not to love? Best of all, they're standing in front of an early-seventies Garden State Plaza, which, even though we can't see much of it, is really my main point here. The beautiful birdcage in Cherry Hill Mall (or Cherry Hill Shopping Center, whichever you prefer). "A view of the 20-foot high aviary housing colorful tropical birds. One of many delightful points of interest in this unique shopping world of over 100 street and shops all under one roof, where the temperature is always spring time." The Park City Center back in the 1970s, as seen from the mall's parking lot (where's there's some pretty groovy cars, too). Among the mall's current anchor/major store lineup are: JCPenney, Sears, H&M, The Bon-Ton, Boscov's, and Kohl's. Check the "previous entries" below for a lot of other great Park City Center photos as well as more historical background info and great reader memories. "Mall of America wants biggest mall title"
(Excerpt) ST. PAUL, Minn. - The Mall of America was the biggest indoor mall in the country when it opened in 1992. It wants its top spot back. The mall, now the nation's third-largest by retail square footage, is planning an expansion that would more than double its size by adding a 6,000-seat music theater, hotels, and an ice rink. The $1.78 billion project would add new stores, too, including a Bass Pro outdoor retailer, and would connect the mall to the nearby IKEA home furnishings store. 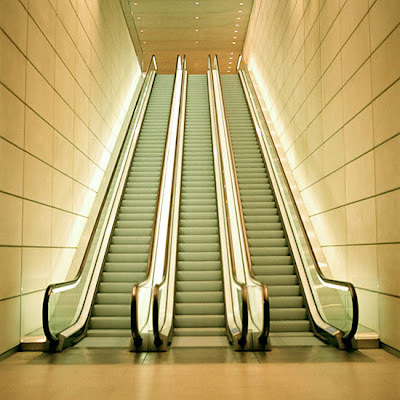 Escalators at Canary Wharf, in London, England. While there are certainly plenty of stores and shopping opportunities to be had at and around Canary Wharf for the retail-minded, my focus for this Galleria post is simply on its escalators. This very cool shot was taken by Toronto photographer, Finn O'Hara, and I just really dig it. Not a mall shot, but I still dig it. Like the mannequin pictures I (for whatever reason) enjoy featuring often here at Malls of America, you can also add escalators to the list. I like pictures of those, too. Now that I think of it, I like riding on them as well. So when are they finally going to turn all our sidewalks into 'em like on the Jetsons? I want that! "This 1991 slide show and lecture was given to attendees in San Antonio and is a variation of Andres Duany's very popular and well-received presentation that he gave to universities, architectural conventions, urban planning groups and anybody who would listen to him." Note: Just to get us started I'm hosting part one here on MOA, but there's 9 segments in all, so after you watch the first one, simply click here to go to the playlist for the rest on YouTube. Hope some of you find it as interesting as I did! Lakewood Shopping Center (now officially called Lakewood Center), just epitomizes retro cool and swank to me--the vintage version I mean. Oh it's still a pretty nice mall today, but it's not retro cool like this anymore! It's currently anchored by JCPenney, Macy's (formerly Robinsons-May), Mervyns, and Target. The vintage postcard photo above was taken in much earlier, swankier days, of course, probably from right around 1952 when the shopping center first opened. There's a Columbia store visible on the left, among others, and the distinctive May Company anchor store in back with the big "M" logo. The card's short caption simply says: "The Attractive And Colorful Shopping Center, Lakewood, California." On March 22, 1975, the small tourist community of Lake Buena Vista Village in Orange County, Florida, officially opened to the public as an annexed part of the Walt Disney World Resort theme park, which was primarily located about five miles away. The village included (and still does) a dedicated shopping plaza area called the Lake Buena Vista Shopping Village, which the above photo welcomes you to. Above is The Flower Garden store, one of Lake Buena Vista Shopping Village's early swanky looking shops. Both great images in this post are courtesy of Big Brian's Disney Page, an awesome site for Walt Disney World nostalgia fans (celebrated through vintage postcards). Some really fun stuff there! Nice retro design signage, dating back to around the fifties. This is a recent photo of the Town & Country Shopping Center's original vintage-era entrance sign. I haven't had a chance to research it yet, so I don't know whether or not this shopping center is still in operation today. I just liked the neat sign (courtesy of the swanktastic Roadside Architecture site). (Excerpt) Tysons Corner Center and The Fashion Centre at Pentagon City are for sale. L&B Realty Advisors of Dallas owns all of Tysons Corner and part of the Fashion Centre on behalf of several institutional investors. But L&B wants to target secondary markets and develop lifestyle-type shopping centers. Indianapolis-based Simon Property Group, which also manages Fashion Centre, will buy the remaining interest, according to a source familiar with the negotiations. With 2.1 million square feet, Tysons Corner is the 10th largest mall in the country; it had average sales per square foot of $585 in 2000. The 819,000-square-foot Fashion Centre would not disclose 2000 sales per square foot. But it traditionally has posted the highest such figure in the area-- $750. "The mall opened August 1, 1960 in its original 100-store, open-air configuration. At the time it was the largest shopping center in Portland and in the Northwest region, and claimed to be the largest in the world. (Actually, it had already been surpassed by the Lakewood Center  and the Roosevelt Field Mall .) Although very close to the downtown retail core, Lloyd Center was the first major retail development to seriously challenge it, aimed almost exclusively at commuters utilizing Portland's then-growing freeway system. The original anchor stores were Meier & Frank at the center, Lipman & Wolfe anchoring the west end, and JC Penney and Woolworth anchoring the east. Nordstrom initially opened as shore store in 1963, before expanding into a full-line apparel store incrementally in the mall's west wing." Charming view of the Carlmont Village Shopping Center, a quaint little shopping plaza (not a "shopping mall" per se) nestled away in Belmont, CA. Built in 1955 on 8.3 acres of land, it's still there today, but of course, looks a little different now. I thought this was such a pretty postcard photo, I just had to share it here. Malls of America regular contributor, J, sent me these scans a while back (from the pages of a '60s-era Encyclopedia Britannica) of NorthPark Center Mall in Dallas, TX (commonly referred to as NorthPark Shopping Center in those days). Thanks again for the great submissions J! "NorthPark Center opened in 1965 as the largest climate-controlled retail establishment in the world. Originally developed by Raymond D. Nasher, the center is now owned, managed, operated and leased by husband and wife David J. Haemisegger and Nancy A. Nasher. After a three-year, $235 million expansion that doubled its size, NorthPark Center is expected to surpass $1 billion in sales in 2007. From its inception, NorthPark Center has made world-class art an integral part of its interior landscape. NorthPark received the American Institute of Architects Award for 'Design of the Decade - 1960s' as one of the first commercial centers in the United States to create space for the display of fine art. Over the years as NorthPark Center has remained true to its original design. For the most recent expansion, NorthPark’s owners returned to Omniplan, the architectural firm that originally designed the center with clean, modern lines, signature white brick and highly polished concrete floors. The expansion turned NorthPark’s original U shape into a unique square design surrounding a 1.4-acre landscaped garden known as 'CenterPark'." "Two small courtyards are at the other leg intersections; one now hosts a carousel, the other the bronze statue of a turkey described below. The name Paramus comes from the Lenni Lenape Native American word meaning 'land of the wild turkey' or 'place of fertile soil'. That is why there is a giant metal statue of a turkey in the Paramus Park mall." Thanks (once again) to Charles Freericks, who supplied the photo of the mall for the last post, we now have the above vintage-era shot of the Paramus Park Mall wild turkey statue! It's apparently still there today, btw, albeit now demoted to a more low-key location in the food court on the mall's upper level. To the left is a recent picture of it (2006) I found on Photobucket. Gives a little more perspective on its size, and you can also see a plaque on the display which explains the piece and names its artist (Christopher Parke, I believe). A beautiful vintage postcard view of Edison Mall, baking under the hot Florida sun in the sixties or early-seventies (not exactly sure on the year). This is a shot of the mall's main entrance, with Woolworth's sitting to the right of the photo, a Penneys anchor to the right of that (not sure what store's on the immediate left of this courtyard), and a Maas Brothers store straight back behind this entrance foyer. Check out the "previous entries" below. You can just make out this entrance in a couple of them. "Like, totally, the end of one mall's era"
(Excerpt) Remember, like, Valley Girls? Think back to the early '80s. Think malls filled with mini-skirted teens with big hair and their own special language. Think "gag me with a spoon." Fer shure. You remember. But that was a long time ago. The species has disappeared. And now, the last visible symbol of that era is on the way out: the Galleria is shutting down. There was a time when the Sherman Oaks Galleria was the most famous mall in America, at least among those of a certain age. The Yorkdale Shopping Centre (aka Yorkdale Mall) was such a groovy shopping mall at one time! This retro postcard proves it. Every photo I see of it I love. (I'm talking about the vintage Yorkdale Shopping Centre, of course.) Looks like it was one heck of a swanky shopping destination back then. "Mayfield Mall--Northern California's first fully enclosed, air conditioned, carpeted shopping mall--has more than 50 stores, and parking for several thousand cars. Such well-known firms as J.C. Penney, Joseph Magnin, Woolworth's, and Wells Fargo Bank are tenants of this unique complex on the west side of the city." Thanks very much to MOA reader, Matt, for the nifty shot in this post! This is a totally rad find (that I found on YouTube)! It's a 1981 "Space Port" Mall Arcade employee training slideset video. Space Ports were a franchised chain of shopping mall video arcades that were especially popular in the late-seventies and early-eighties. Mallrats and pretty much any teen who grew up in those days, will remember these loud and funky shopping mall gaming wonderlands. The video above (in two parts) is an interesting (and oftentimes unintentionally funny!) relic of the '70s and '80s shopping mall landscape--albeit from slightly more on the "inside". Lots of shopping malls had Space Ports--among the ones I can think of are: Aurora Village, and King of Prussia Plaza. 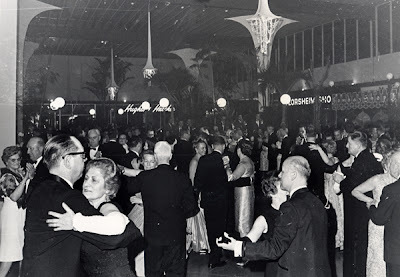 But mainly I just dug the idea that these people (in the first pic) were actually ballroom dancing inside Northway Mall! Something kind of odd looking (and spooky) about that scene. I doubt the mall does this anymore, though, heh. Here are two recent photos of Midtown Plaza from Malls of America reader, Fletcher, who took these shots in 2005 and kindly submitted them here to illustrate how similar the mall still looks today, when compared to all the vintage photographs and postcards I've shared of it on the blog in the past (see "previous entries" below). I have to agree with him. At first glance you could easily take these to be vintage '60s shots. "Designed by Victor Gruen, Midtown Plaza was dedicated on April 10, 1961 as the first downtown indoor mall in the United States. The first enclosed shopping center had been Southdale Center 1956, also designed by Gruen. The idea for this mall started with discussions between Gilbert J.C. McCurdy, owner of the McCurdy's department stores and Maurice F Forman, owner of the B. Forman Co. department stores. At this time strip plazas were growing in popularity. Though both owners had opened branch stores they were concerned about downtown Rochester's viability and came up with the idea of an indoor shopping center. Gruen was at the height of his influence when Midtown was completed and the project attracted international attention. City officials and planners from around the globe came to see Gruen's solution to the mid-century urban crisis. Midtown won several design awards. Gruen described the aerial view of Rochester as a giant parking lot with a few buildings to inconvenience traffic flow. His intention was to create a pedestrian friendly town square for Rochester, NY, a medium sized city near the mouth of the Genesee River. He incorporated art, benches, fountains, a four hundred seat auditorium and a sidewalk cafe into his plans hoping to encourage the sort of social intermingling that he saw as the enriching essence of urban life." Mid-seventies snapshot of Paramus Park mall in Paramus, NJ, taken from the parking lot (the Sears anchor store is visible to the right). Many thanks to Charles Freericks, for this great photo submission! "The mall, developed by The Rouse Company, opened on March 14, 1974, with a 300,000 sq. ft. Abraham & Straus (now a Macy's store) and Sears (which didn't open until August) as anchors and space for 120 specialty stores. Paramus Park was the fourth, and final major indoor (or in the case of Garden State Plaza, soon to be indoor) mall in Paramus. It is shaped as a four-legged zigzag, with an anchor store at each end and the second-level food court on a large balcony in the middle. Two small courtyards are at the other leg intersections; one now hosts a carousel, the other the bronze statue of a turkey described below. I recently came across this interesting radio interview conducted on April 4, 2007, with A. Alfred Taubman, the "shopping mall king", where he discusses some of the subjects found in his new memoir, Threshold Resistance: The Extraordinary Career of a Luxury Retailing Pioneer . Mr. Taubman was interviewed by Frank Beckmann, of WJR-Radio, in the GM Wintergarden studio inside the Renaissance Center in downtown Detroit. Click here to go to the interview (off-site). For my retro mall money, this shot's definitely a keeper! 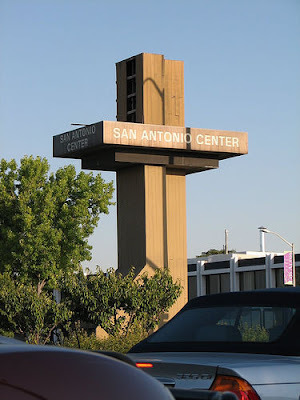 "San Antonio Center has gone through many incarnations. It started in the 1950s as a stand alone Sears Department Store surrounded by bean fields. It grew over the years and became Downtown Mountain View's first major competition. By the 1970s the center had expanded into the pedestrian mall viewed here in this picture. During Christmas time this fountain was covered up and became a place to meet Santa Claus. At its height in the early 1980s, the mall connected Sears, JC Penny's (which had moved from Mayfield Mall) and Meryvn's. It was also home to the Menu Tree restaurant, a strange two story international restaurant remembered for its use of dozens of cuckoo clocks for decoration. The mall fell on hard times in the early 1990s and grand plans for its expansion fell through. Most of the mall was demolished to make way for Wal Mart and a parking lot, although a remainder of the mall can still be found behind Sears." Here's a nice little video tour (via Ben's Tours on YouTube) of the Ala Moana Shopping Center as it looks today. I kind of dug this and thought it might be of some interest here as it helps put the mall into some modern perspective for us (as does this link). Finishing a couple more posts from earlier this morning, when my internet connection suddenly conked out on me because it hates me. So this is the distinctive entrance sign at the San Antonio Shopping Center, in Mountain View, CA. Photo was taken in July of 2005 (courtesy of Marcel Marchon). I'm not sure how far back this particular signage design goes at this mall, so I don't know exactly how "vintage" it is (does anyone else? ), but either way it's an interesting looking sign, isn't it? "Sunvalley Mall is a regional shopping center located in Concord, California (one of the suburbs in the San Francisco Bay Area, in east central Contra Costa County). Sunvalley opened in August of 1967 with JCPenney and Macy's as anchor tenants. The mall was attached to a pre-existing free-standing Sears store that was built several years earlier. At its opening it was considered the largest air conditioned regional shopping center in the world. It was developed by the Taubman Company, which is still the owner and operator of the mall to this day. The mall's major department stores are two separate locations for Macys, and one each for Sears and JCPenney. Sunvalley has 170 stores and a total size of about 1.4 million square feet." Funky interior design--'70s shopping mall style! 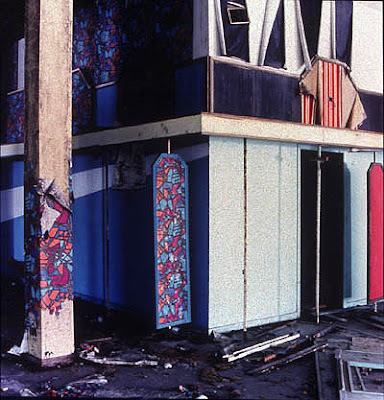 Back in 2001 photographer, Christopher Trice, documented the abandoned remnants of the Dixie Square Mall in Harvey, Illinois, for his "Dixie Square Mall Series". Here are a couple of the Montgomery Ward images from it that I dug due to the obviously frozen-in-time state of vintage '70s (or '60s?) decor they capture--interior store design still left over from retail days long gone by. Of this series Trice said: "My work at Dixie Square Mall is an effort not to find beauty, but to create it." Tough assignment from the looks of things. "In The Dixie Square Mall Series, Christopher Trice examines the space and socioeconomic import of a long-abandoned shopping center in one of Chicago’s south suburbs. Dangling wires, fallen ceiling tiles, and peeling wallpaper evidence the decay of otherwise familiar store interiors now ravaged by vandals and weather alike. 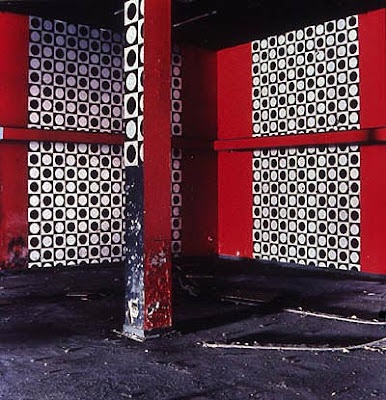 Yet the attention to color and closely controlled composition of Trice’s photographs transcend the merely documentary, generating a beauty otherwise absent from this crumbling structure." Exterior of the Powers "Highland" department store that was once located in the Highland Village Shopping Center. As this is more of a strip mall shopping plaza and not an enclosed mall, I'll dispense with the usual "mall" info summary at the bottom of this post (as I usually do with these), but I did uncover that this little strip mall first opened (very humbly) in 1939, and was then appreciably expanded throughout the '40s and '50s. "Breaking Through to Big Profits"
(Excerpt) Break dancing has been banned from certain shopping malls, sidewalks and no doubt countless living rooms as a public nuisance. But the ghetto-born dance fad, with its twirls, windmills and head spins, has shown remarkable staying power. As a result, dozens of entrepreneurs are making a fast break to cash in on its widespread popularity among teenagers by spinning off such accessories as clothing, how-to books and video games. Wrangler, the jeansmaker, in January will begin selling its Wrapid Transit collection of break-dancing fashions in red, purple, blue and black. The twill pants ($25) will be loosely tailored in the legs and reinforced in the seat and knees. The jackets ($30) will be sleeveless, with six pockets. Van Doren Rubber of Anaheim, Calif, has produced a special red-black-and-white version of its Vans wrestling shoe ($32), designed for break dancing's fast footwork. Here's a very retro looking sixties postcard photo of a court fountain and Bell shoe store inside Eastwood Mall. This one really has that vintage mall stink all over it, which I love! The original scan came from the great Eastwood Mall fansite, that unfortunately appears to be gone of late. "Eastwood Mall, located in metropolitan Birmingham, Alabama, was the second enclosed shopping mall in the Southeast; this following the opening of North Carolina's Charlottetown Mall, which debuted on October 28, 1959. 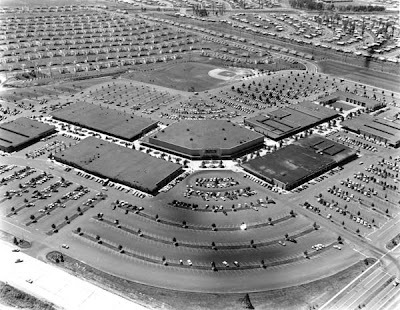 Eastwood Mall opened on August 25, 1960. The original tenant list included J.J. Newberry and S.S. Kresge (two defunct five and dime chains), as well as J.C. Penney, a Kroger supermarket, and Colonial Stores supermarket, (which became a Hill's Food Store, and eventually evolved into Winn-Dixie). 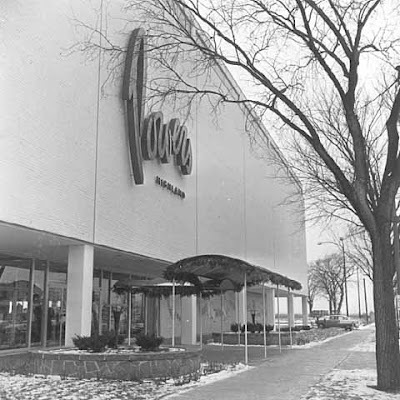 The mall had no major department stores until the mid-to-late 1960s. Anchors that have been connected to the center over time include Parisian, Pizitz, Yielding's, Service Merchandise and Party City. 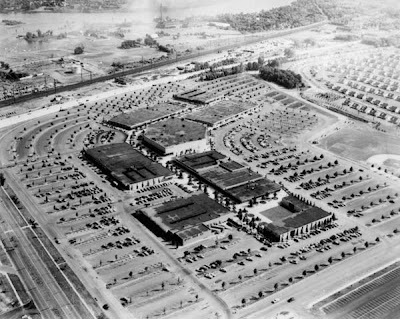 Eastwood Mall was the creation of Newman H. Waters, who owned a chain of drive-in theaters in the Birmingham area, including one adjacent to where Eastwood was built. Early advertisements for the mall boasted of its 'Air Conditioned Sidewalks' and dubbed it 'The Merchandise City of the Future'." Swinging '60s ladies shopping and chit-chatting inside a fashionable store in a vintage-era Eastwood Mall. Don't know if this was a boutique, salon, or just the women's department of some larger store, but whatever it is, it looks pretty groovy to me. In the '70s I remember getting dragged into lots of these kinds of stores by my mom as a kid. I didn't mind too much though, because even at that young age (we'll say around 10) I'd always use the opportunity to "scope out the chicks"! Usually meaning any cute 9 or 10 year-old girls who got dragged in by their mothers, too. And sure, sometimes I even scoped out their foxy, hot pantsted, go-go booted moms, too, I'll admit it. I had that kind of game. "Mall king A. Alfred Taubman's memoir tells of Sotheby's price-fixing scandal"
(Excerpt) BLOOMFIELD HILLS, Mich. (AP) - A. Alfred Taubman, ignoring all of his instincts, stayed silent during the price-fixing trial that would end with a prison sentence for the former owner of Sotheby's auction house. It was a decision that the luxury mall developer and philanthropist sees as a critical mistake as he reflects on a career in retailing that began as a discount store salesman and eventually put him at the centre of an art world scandal. "I should have gotten on the stand," the 83-year-old billionaire said in a recent interview in his office at the suburban Detroit company he founded in 1950. "By building a few large, centralized shopping centers, Levitt hoped to avoid the problems associated with haphazardly placed and often unsightly commercial strips. Levittown's main shopping center was not only large—at the time, the biggest shopping center east of the Mississippi—but also meticulously landscaped. During the 1950s, Levittown's commercial hub was the Shop-a-Rama, a 60-acre pedestrian mall featuring over 65 retailers and a variety of special events. For many residents, the shopping center was Main Street. When completed in 1955, it was the largest pedestrian shopping mall east of the Mississippi. Levitt favored chain retailers such as Food Fair, Pomeroys, Woolworths, Kresges and Sears. The center’s parking lot could accommodate 6,000 cars."